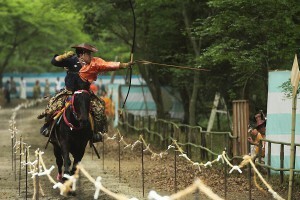 Yabusame means horseback archery activities, which originated from 6 century A.D, when Kinmei emperor prayed for the peace of his kingdom and the rich of his people by shooting off three board on a running horse. However, it does not formally become a ritual until 12 century A.D when Minamoto Noyoritomo changed Yabusame into one of the famous ritual in Japan. Nowadays, many shrine all over Japan offer the chance to take a look of this wonderful ritual which combines skill and strength. 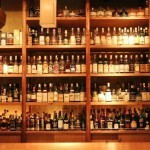 As the famous spot in Tokyo, here seems to be the best spot to watch Yabusame if you travel to Tokyo. At the meantime, Rei Fes. is also the biggest ritual in Meji Shrine since 11/3 was the birthday of Meji emperor. As three of most famous festival in Kyoto, you can’t miss Aoi Fes. During the Aoi Fes., there are many traditional ritual events including Yabusame as well! 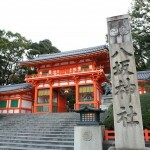 Osaka Tenman shrine is also a popular tourist spot to visit if you travel in Kansai area. Since Autumn big fes. is also an important festival for Osaka Tenman shrine, you definitely can enjoy your time there. Differ from the other place, Yabusame in here is being treated as one of the traditional activities instead of ritual activities. Beside form Yabusame, Kumamoto castle is also a good place to visit in order to learn more about Japanese castle and traditional activities. As you can see in the video, Yabusame is an activities combining skill and strength, which means it might become dangerous as well. 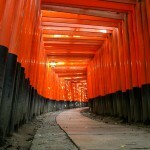 However, if you follow the rules, it can become one of your most amazing experience in Japan! On the other way, Yabusame can be divided into many styles depending on which part of Japan the shrine is at and what kind of shrine as well. As a result, it is recommended that you should not only be amazed by the skill the archer showed but also try to figure out the difference of their clothes and style of shooting! Follow the staff’s instruction to prevent the danger of this activities from happening.